Jorge Newbery Airfield (Spanish: Aeroparque "Jorge Newbery", IATA: AEP, ICAO: SABE) is an international airport located in Palermo neighbourhood, 2 km (1.2 mi) northeast of downtown Buenos Aires, Argentina. The airport covers an area of 138 hectares (341 acres) and is operated by Aeropuertos Argentina 2000 S.A. It is located in the Palermo ward, along the Río de la Plata, and serves as the main hub for domestic flights. Since March 2019, it only serves international flights to Uruguay. The airport was originally proposed by Mayor Carlos Noël in 1925. A number of feasibility studies and zoning disputes followed. In 1938, plans were submitted for an island airport connected via causeway to Avenida General Paz (then under construction). 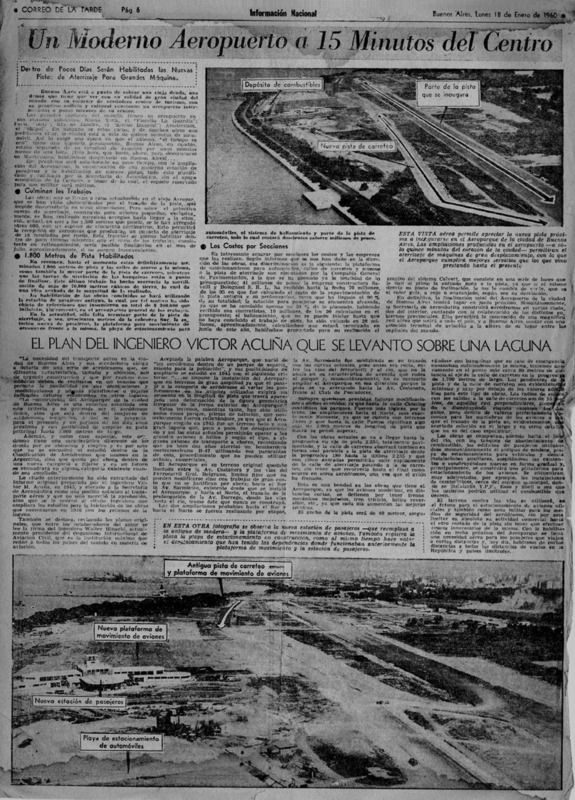 A former wetland reclaimed in 1916 from the Río de la Plata and closer to downtown was selected instead, and the facility, designed by Aeronatics Secretariat engineer Víctor Acuña in 1945, was inaugurated in 1947 as Aeroparque 17 de Octubre (17 October Airfield). Initially served by a 1,000 m (3,300 ft) runway, it began operations in January 1948 as the main hub for domestic flights from Buenos Aires as well as flights to Uruguay. Its first terminal was completed in 1951, by which time the runway was extended to 1,550 m (5,090 ft). The airport was renamed following the 1955 coup against President Juan Perón in honor of the pioneer of Argentine aviation, Jorge Newbery, and was re-inaugurated in 1960 following work that expanded its main runway to 2,070 m (6,790 ft) and added a new terminal. The Argentine Air Force had a small base built near the eastern end of the airport in 1965; it was at this site that President Isabel Perón was formally deposed by the military in the March 1976 coup. A new terminal for national air carrier Aerolíneas Argentinas was inaugurated in 1981, expanding total terminal area to 30,000 m2 (320,000 sq ft). Plans to merge Newbery with Ezeiza International Airport in a new facility located on an artificial island were revived in 1996 by a commission headed by Congressman Álvaro Alsogaray, though these plans were ultimately dropped. Its operations, like those of all the nation's public airports, were privatized in 1998 and transferred to Aeropuertos Argentina 2000 (part of the conglomerate owned by local businessman Eduardo Eurnekian). The runway was further extended by 180 m (590 ft) in 2007, and work began in 2009 to create greater distance between the nearby Rafael Obligado Coast Highway and the eastern end of the runway. Routes were added in March 2010 to destinations in Brazil, Chile, and Paraguay. Work began in 2011 on Terminals III and IV, totaling 35,000 m2 (380,000 sq ft). These terminals were inaugurated in March 2014, effectively doubling the airport's passenger capacity. However, a recent increase in the number of airlines and flights operating at the airport has brought it to the limit of its capacity. Thus, the government decided to move all international flights (with the exception of those to Uruguay) to Ezeiza Airport from 2019. 1.77% N.A. N.A. N.A. N.A. 28.71% N.A. N.A. N.A. N.A. 11.78% N.A. N.A. N.A. N.A. 37.29% N.A. N.A. N.A. N.A. 1.81% 84,844 N.A. 30,312 N.A. 9.17% N.A. N.A. N.A. N.A. 7.25% N.A. N.A. N.A. N.A. 7.94% N.A. N.A. N.A. N.A. (Years 2005-2010) and other sources. On 11 January 1957, LADE Vickers Viking T-11 crashed on take-off. All 35 occupants perished. On 30 June 1961, Transcontinental S.A. C-46 Commando LV-FTO crashed on landing approach. Of 35 occupants, 24 died. On 17 December 1969, Austral Líneas Aéreas C-46 Commando LV-GEB lost engine 1 due to fuel exhaustion shortly after takeoff. The plane failed to gain height and made a crash landing in a small sport field. Both of the crew members survived without injury. On 11 May 1975, Vickers Viscount CX-AQO of PLUNA was damaged beyond economic repair when it departed the runway. On 7 May 1981, Austral Líneas Aéreas Flight 901, a BAC 1-11, crashed on approach after a flight from Tucumán. All 31 passengers and crew were killed. On 24 February 1999, Aerolineas Argentinas MD-88 LV-VBY was destroyed by hangar fire. On 31 August 1999, LAPA Flight 3142, a Boeing 737-200, crashed shortly after takeoff due to pilot error. 63 of the 100 passengers and crew were killed. Two people on the ground were also killed, raising the death toll to 65. ^ Tablero 2017 Aeroparque Jorge Newbery (in Spanish) EANA. ^ a b "Aeroparque Jorge Newbery". Atlas Ambiental de Buenos Aires. Archived from the original on 28 June 2012. ^ a b "Aeroparque no se muda, aunque sí se modifica". La Nación. 14 April 2004. ^ a b "Un moderno aeropuerto a 15 minutos del centro". Correo de la Tarde. 18 January 1960. Archived from the original on 18 April 2014. ^ a b c Reznik, Constanza (2008). "Proyecto de graduación – Seguridad aeroportuaria" (PDF). Universidad de Palermo. ^ "Fuerza Aérea: Guarniciones y unidades". Aeromilitaria Argentina. ^ Lewis, Paul (2002). Guerrillas and Generals. University of North Carolina Press. p. 127. ISBN 0-275-97360-3. ^ "Avanza con demoras el plan para ampliar la pista de Aeroparque". Clarín. 20 July 2007. ^ "No avanza la extensión de la autopista Illia hacia el Norte". Clarín. 25 March 2010. ^ "Ya operan desde Aeroparque los vuelos a países limítrofes". Los Andes. 15 March 2010. Archived from the original on 22 May 2014. Retrieved 6 May 2013. ^ "Nuevas obras en el Aeroparque Jorge Newbery". Helport. 10 May 2011. Archived from the original on 2 October 2013. Retrieved 6 May 2013. ^ "Cristina destacó la transformación del aeroparque "desde que se incremento la economía y el turismo". Telam. 26 March 2014. ^ 2017, UBM (UK) Ltd. "Amaszonas plans Buenos Aires – Punta del Este route from Dec 2016". ^ "Traductor de Google". translate.google.com. ^ "Aumento del 4.4 por ciento en el tráfico de pasajeros en 2013". Aeropuertos Argentina 2000. 14 January 2014. Archived from the original on 2 April 2014. ^ Accident description for Vicking T-11 at the Aviation Safety Network. Retrieved on 30 September 2017. ^ Accident description for Curtiss C-46 LV-FTO at the Aviation Safety Network. Retrieved on 30 September 2017. ^ Accident description for LV-GEB at the Aviation Safety Network. Retrieved on 30 September 2017. ^ "ASN Aircraft accident BAC One-Eleven 529FR LV-LOX Buenos Aires-Jorge Newbery Airport, BA (AEP)". Aviation-safety.net. 7 May 1981. Retrieved 30 September 2017. ^ Incident description for LV-VBY at the Aviation Safety Network. Retrieved on 4 January 2012. ^ Accident description at the Aviation Safety Network. Retrieved on 30 September 2017.